Despite Rav Kook (1865–1935) being one of the most influential thinkers in Jewish history, his revolutionary writings are mostly unknown to the general public. This book contains many new and accessible translations, as well as an in-depth spiritual biography. Each chapter is introduced and broken up into a variety of topics, including the individual, Torah, God, teshuvah, prayer, creativity, Zionism, science, and vegetarianism. 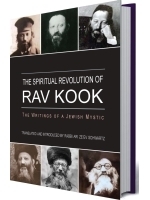 This book features an entirely new, original, accessible translation of a diverse selection of Rav Kook’s writings. This work offers a surprisingly modern model of religion from the perspective of a spiritual leader who was ahead of his time.